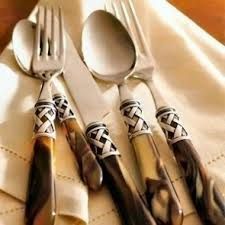 Vietri Italian flatware adds a bit of Tuscan charm to your table and dining experiences. Vietri flatware is sold in a variety of styles ranging from flatware with acrylic, stainless steel or pewter handles. There is also flatware for children. All flatware fork heads, spoon heads, knife blades, and serving piece heads are made of 18/10 stainless steel. Vietri acrylic flatware is sold with a variety of handle embellishments including lattice, Oxford and Selena, but not all colors are available in each handle embellishment. The lattice acrylic handles are available in all colors, Oxford is available in ivory, taupe and tortoiseshell and Selena is available in charcoal and tortoiseshell. Colors available with the antique or brilliant lattice embellished handle are: Pearl Blue, Chartreuse, Charcoal, Clear, Green, Horn, Ivory, Red, Tortoise Shell, Taupe, and White. Vietri Stainless steel flatware is 100% 18/10 stainless steel, while the fine pewter-handled flatware is stainless steel only on the eating ends of the flatware; the handles are made of solid pewter. Whichever style you choose, you are sure to receive fine quality flatware from Vietri. Made in Italy.